Research indicates that one of the most critical challenges facing organizations is developing leaders with the requisite skills to succeed in the global and complex work environment. In 2012, members of the ASTD Forum explored many ideas related to the theme of "Enhancing Executive Global Leadership Skills" as part of their inaugural workshop for members residing in India. The research included investigating various dimensions of global leadership—what is unique about it, what are the major challenges, what are the key competencies needed, and what learning strategists need to focus on for developmental experiences. The project started with a belief that global leaders need specific leadership development because of more complex challenges created by differing cultures, time zones, and the need to collaborate and build alliances across geographic distances. However, many leaders in the current work environment are managing dispersed workers within the same culture and time zone. This includes working in a distributed environment, having workers at client sites, having multiple organizational sites, and teleworking. establish and maintain trust in a diverse environment with multiple cultures. What is the extent and mix of leaders relying on technology? 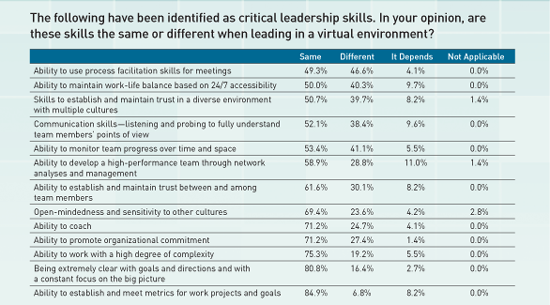 What are the greatest challenges for leaders when work is in a virtual environment? What are best practices for developing the requisite skills needed to effectively lead in a virtual environment? Work using a virtual approach appears in almost all organizations but in a wide array of configurations, from one person working remotely to whole offices collocated. The Nemertes Research Group estimates that there's been an 800 percent increase in virtual workers during the past five years. In Managing the Mobile Workforce, David Clemons and Michael Kroth describe how the rules or assumptions about work have changed. "'I am going to work' is now ... 'I have work that needs to be accomplished.' Work used to take place between 8 a.m. and 5 p.m. Mobile workers think of work as taking place between when it is assigned and when it is due." According to one Forum interviewee, 35 percent of his organization's employees are dispersed. However, as part of standard work practices, probably 95 percent are regularly connecting with others in other locations, many remote. "It is almost impossible to work with only U.S.-based members, and it is impossible to work only within your physical building," he says. It may, at first glance, seem like a dream come true to work in the comforts of home or the local coffee shop and never see the boss. However, satisfaction fluctuates wildly among virtual workers. In a large Forum survey of virtual team members, 46 percent of respondents report a sense of isolation due to a lack of face-to-face contact with team members. Time zone differences are mentioned frequently as one of the biggest challenges for virtual workers because they hinder the ability to collaborate and can cause team members to miss deadlines and have other work-related issues. "Our primary challenge is using the global clock effectively and fairly; the time for a large meeting with global leaders has stabilized at 6 or 7 a.m. EST," says one Forum member. "However, for smaller meetings, a best practice is for the leader to ask a subordinate to set the time." All interviewees agree that many of the leadership skills are the same, but they are executed differently in a virtual environment. "Leadership is leadership. Being authentic, connecting with others, promoting inclusiveness, networking, and all of the interpersonal skills that build relationships and trust are always important," says one interviewee. In a virtual environment, "the actions associated with these skills must be deliberate and intentional. Thus, leaders need a defined strategy for doing and using the skills along with actions for execution, as well as a way to measure results." Early research on virtual leaders reveals a similar conclusion. In "Examining the Relationship of Leadership and Physical Distance With Unit Performance," a 2005 article in The Leadership Quarterly, Jane Howell and her colleagues found that leaders at a distance need to work harder at relating to associates' needs and aspirations to have the same level of positive impact that they would close up. Look at virtual leadership from a leader's perspective and the challenges increase. "Leaders must reach out and check in more frequently in a virtual environment. These personal connections build trust and relationships, but do not just happen. They are designed, planned for, and very intentional," says an interviewee. The words that were used repeatedly when describing the differences between leading in a collocated environment and a dispersed environment were "planned," "disciplined," "deliberate," and "intentional." One interviewee discussed the ease of formal and informal check-ins and face-time leaders can have with their collocated team members—at meetings, in the hallways, by the water cooler, and in the parking lot, for example. However, "The challenges for a leader to create a sense of connectedness in a distributed work environment are huge, especially trying to maintain a sense of unity and wholeness with myriad geographical parts," she adds. Our interviews and survey indicate that for some leaders the ability to manage distance appears to be less of a challenge now than perhaps when they first started. It may be that the negative impact of distance is reduced over time. If that's the case, could learning designers help with that transition? The ASTD Forum survey identified many practices for effective leadership in a mobile workforce. Communications. Communication skills are the top-rated skill to include in leadership development, according to the survey. This includes a variety of media formats such as phones, email, instant messaging, virtual media, web conferences, and Skype. Survey participants indicate that training should mirror their virtual work. Another component of communication is the frequency of discussions. In collocated teams, it is the leader's responsibility to keep everyone on the same page and to check in often. Team member accountability for participation and engagement also is critical when working from a distance. Additionally, listening is important to successful teams. However, listening without visual clues involves a whole new skill set. Participants stress the importance of leaders modeling the behavior that they expect in their teams. It was noted that leaders have a large role to play in designing opportunities for all team members to be heard and to be engaged. This means extensive use of questions to increase understanding and to offset the lack of visual information. Team building. An initial face-to-face meeting comes up time and again as a way to build a team early on. This establishes trust and helps promote engagement and synergy. Many of the interviewees also suggest annual or semiannual face-to-face meetings. However, this is not always possible. An understanding of virtual team dynamics is critical for leaders and team members to be effective. Organizations need to provide realistic budgets to promote the development of higher levels of performance and to put a premium on understanding the signs of low trust in virtual environments so that they can be addressed. fun and creative reconnecting activities as part of scheduled meetings to have members get familiar with and associate a voice with a person. Protocols. Teams need to establish ground rules or protocols that set the tone for a successful team and help to build and maintain trust. Clear, consistent, and detailed protocols that revolve around goals, deadlines, technology etiquette, and cultural norms appear necessary. Up-front guidelines for the work and the expected goals typically results in fewer pitfalls later in the process. The goal of any team is the work product, not the time spent at the desk working on a project. This was stated in numerous ways during the interviews. This means leaders who are more adept at keeping teams focused on the business goals generally demonstrate a higher level of success. It also means clear metrics, roles and responsibilities, and feedback are critical to producing high-quality deliverables. One of the interviewees shares how her organization focuses on a culture of organizational excellence—which includes encouraging distributed leadership, accountability, and results-focus. While guidelines are published, the focus is operating around the organizational values. This gives leaders at all levels autonomy to be more successful. One of the many practices supporting this approach is providing training and support for all leaders. Ask leaders at all levels: What structures do you need to ensure successful engagement of your team? What resources are available to help your team bridge a gap or eliminate a barrier to getting the desired results? All leaders need a basic understanding of what it means to lead effectively in a complex and changing environment. But there is something elusive about leading from a distance. While at first glance it may seem that all the same leadership skills are needed, it may be that leaders in a virtual environment need just a little more of everything: more knowledge of technology, more knowledge on how to work with team dynamics, stronger communication skills, and of course, a little more patience. Virtual work and learning environments with dispersed teams are here to stay, so finding ways to work effectively to harness the collective energy of these teams is critical to the success of organizations for now and in the future. But for learning leaders responsible for creating experiences and content for enabling leaders to gain skills for these changes, the challenges may be even greater. More information about the ASTD Forum is available at www.astd.org/forum. Donna Dennis is a leadership development consultant with a background in corporate training and development. For the past eight years, she has been managing director of Leadership Solutions Consulting where she has focused on working across distances and what leaders must do to be successful managing mobile workforces. Dennis has conducted research and continues to build resources to respond to the needs of virtual leaders and employees. She is currently adding to virtual leadership curriculum with a new course called Coaching from a Distance. She assisted with the Canadian Management Center’s customized course for a global client that included face-to-face delivery, WebEx delivery, and e-learning. Adapting content to virtual delivery is a key to success for these complex assignments and Dennis is known for interactive and on-target content and learning. She is committed to using the best methods, tools, and research in the development and delivery of training. Earlier in her career, Dennis worked for RCA, GE, The Hospital of the University of Pennsylvania, Chubb and Son, and C.R. Bard in various leadership development positions. Prior to corporate work, she spent nine years teaching in academia (Parkland College, Champaign, Illnois; The Wharton Business School at the University of Pennsylvania; and Rider University). Denis currently spends part of her time supporting the research projects of The Business Research Collaborative and teaching. She teaches "Leading Virtual Teams" at the Gestalt International Study Center and a variety of leadership courses, including Leading Virtual and Remote Teams and Coaching from a Distance for the AMA. Dennis received her M.S. in education from the University of Illinois and her PhD in human and organization development from The Fielding Graduate Institute. She has earned numerous certifications and completed advanced training in coaching through the Gestalt Institute, Alliance for Strategic Leadership (Marshall Goldsmith), and Psychological and Leadership Assessment through such instruments as: 16 Personality Factors, CDR 3-D Suite, Myers Briggs Type Indicator, Emotional Intelligence, and Multi-factor Leadership Questionnaire (MLQ). Deborah Meola is a professional writer and co-author of Preparing for Leadership: What it Takes to Take the Lead. MJ leads the ATD Forum content arena and serves as the learning subject matter expert for the ATD communities of practice. As the leader of a consortium known as a “skunk works” for connecting, collaborating, and sharing learning, she worked with members to evolve the consortium into a lab environment for advancing the learning practice within the context of work, thus evolving the Forum’s work-learn lab concept. MJ is a skilled and experienced design and performance coach for work teams, as well as a seasoned designer of work-learn experiences with a focus on strategy and program management. She previously held leadership positions at the Defense Acquisition University, including senior instructor, special assistant to the commandant, and director of professional development.